1. Ultra long-distance(up to 10 meters) wireless transmission. 2. 3 buttons: scroll wheel,left button, right button. 3. It's out of power if the mouse pointer moves slowly or stop moving. 4. 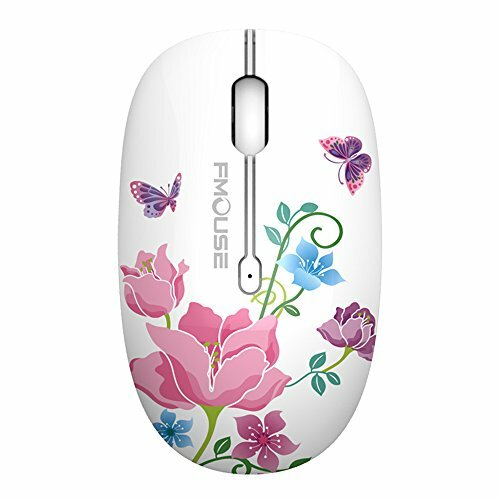 This mouse fits naturally in your hand,color pattern coating and UV highlight technology for fashion colorful design. 1. Take the dongle out, which is in the battery compartment of the mouse. 2. Insert the dongle into the USB port of your PC. 3. Turn on the mouse, the switch is at the bottom of the mouse. 4. Allow a few seconds for installing, no action needed, just wait. Then you can use the mouse. 2.4GHz WIRELESS: Ultra long-distance(up to 10 meters) wireless transmission,10 acceleration. The receiver is hidden in the battery slot, small size, taking up minimal space. POWER-SAVING MODE: Extremely low power consumption. It will automatically be in sleeping mode to save battery when mouse is idle after 10 minutes , pls click any button to wake it up. EASE TO USE: No additional software required, simply plug and play. Colorful design is suitable for modern young people and children. Note: only 1 pcs AA battery needed for power supply (Not included). CURSOR CONTROL:High performance optical sensor ensures excellent precision and control.